Lewes FC made their debut in the new Women’s Championship with an impressive win over Millwall Lionesses at Dartford FC, reports Stuart Fuller. John Donoghue went into the game with a strong line up, opting to play Amy Taylor as part of a back three, whilst the Irish duo of Vicky Carleton and Avilla Bergin looked to give the side width. Sarah Kempson returned to the squad after her beach soccer exploits but had to make do with a place on the bench. Having had two weeks to prepare for their league season opener, The Rooks wasted no time in making their mark in the game against a young Millwall team when Sam Quayle looked to take advantage of some smart play from winger Vicky Carleton in the second minute that the hosts had to desperately clear. From the resulting Katie McIntyre corner Quayle acted the fastest as the ball bounced around the area and nodded it goal wards. Despite a desperate attempt to clear the ball off the line, the referees assistant signalled that the ball had crossed the line and Lewes had made a perfect start, with less than three minutes on the clock. The Rooks quickly got into their rhythm, with patient passing the order of the day as they looked for gaps in the Millwall back-line, whilst Faye Baker was almost a spectator for the opening fifteen minutes. The Rooks most dangerous threat came down the flanks with both Carleton and Bergin testing their markers constantly and it was no surprise to see them both enjoy a lot of the ball. However, it was Millwall Lionesses who had the best chance of the first quarter after a rare mistake by the Lewes defence. Baker’s goal-kick fell direct to the young Fitzgerald and she played in Ravenscroft but the linesman’s flag was the Rooks friend. The second goal came in the 24th minute whenRebecca Carter picked up a cross-field ball from Macca and she made no mistake with a shot from the edge of the box that found the corner of the net. Just a couple of minutes later a Thompson through ball saw Sam Quayle almost in on goal. 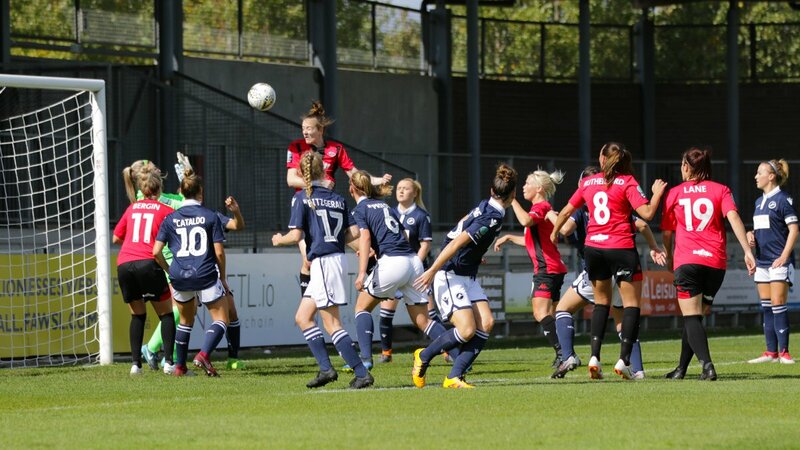 The Rooks strong performance wasn’t just happening at the Millwall end – Amy Taylor made a superb last-ditch tackle when Ravenscroft was through on goal, timing her tackle perfectly. In the 35th minute, Danni Lane hit the bar after a free-kick expertly delivered from the by-line by McIntyre but the Rooks didn’t have to wait too long to celebrate again when Carleton accelerated into the area, played in Quayle and rather than shooting herself, played the ball side-wards to Avilla Bergin who was in acres of space and made no mistake from 8 yards out. Half-time and it couldn’t have been a better opening 45 minutes in the Championship for the Rooks. Lewes started the second-half as they did the first, pressing the Lionesses high in their half, forcing them into mistakes. However, it was the home side who had the best chance in the opening period as Ravenscroft got the wrong side of Taylor but the referee deemed her turn as a foul – a let-off for the Rooks. The story of the half was certainly the danger the Rooks caused Millwall from set-pieces with McIntyre time and time again delivering excellent balls right into the heart of the action and causing some desperate defending at times but unfortunately not proving to be goal scoring chances. Bergin was a constant threat when she came off her wing, cutting inside at pace and twice hitting efforts on goal that just floated wide. However, it was Quayle who nearly finished off a superb move with 15 minutes left as she poked just wide after brilliant approach play down the left-hand side from McIntyre and Carter. John Donoghue brought on Rosy Paye for Tasha Wells with 12 to play and then Sarah Kempson and Shannon Moloney for Sam Quayle and Leeta Rutherford for the final five minutes as the Rooks looked for goal number four. Rebecca Carter nearly had it as her strike from all of 30 yards was well saved by the Millwall keeper. Full-time and a comfortable 3-0 for the Rooks, but more importantly all three points safely tucked away for the trip back to East Sussex. After the game boss John Donoghue spoke to Stuart Fuller about the preparation for the season, the performance and looking forward to the Continental League Cup game againstArsenal next Sunday.